In this recipe, you will prepare a classic vinaigrette, prepared with shallot, lemon, chili and olive oil. This vinaigrette is then used to coat a healthy serve of local broccolini and green beans. Served over a bed of cauliflower “rice” you’ll feel very impressed with yourself at preparing such a healthy and delicious dinner. Share the moment #youplateit with us on Instagram and enjoy! Wash the fresh produce. Bring a large pot of salted water to boil. Remove and discard the core of the cauliflower, then finely chop using a food processor or a knife. In a large pan (or pot), add cauliflower rice and up to ½ cup water. Cook, stirring occasionally, for about 5 - 8 minutes, or until the cauliflower has softened and the water is absorbed and is cooked to your liking. Season with salt and pepper. Stir in half the parsley, roughly chopping as you add. Cover to keep warm. In the meantime, small dice shallot, then add 2 TBS to a small bowl. Add lemon zest, then squeeze in 1 TBS lemon juice. Add chili flakes (using as much or as little as desired). Gradually stir in 2 TBS olive oil and season to taste. Trim the ends off the green beans. Add the green beans to the pot of boiling water. After 1 minute, add broccolini. Boil for 2 minutes more. Drain immediately. Pat dry prawns with paper towel. In a large pan, heat ½ TBS of olive oil and butter on medium until hot. Add the prawns; season with salt and pepper. Cook, stirring frequently, 30 seconds - 1 minute, or until opaque and just cooked through. Turn off the heat. In a large bowl, toss the cooked green beans and broccolini with enough of the vinaigrette to coat. Season to taste. Divide the green beans, broccolini and cauliflower rice between plates. 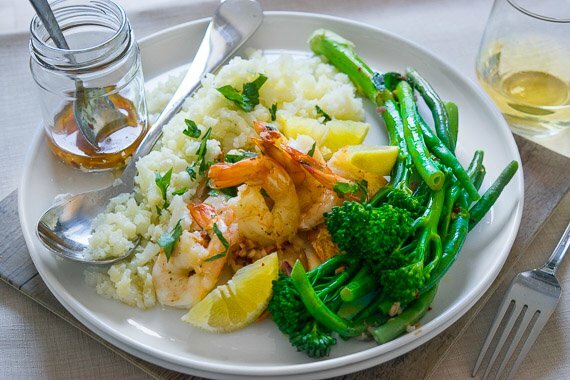 Top with the prawns and drizzle with vinaigrette. Scatter with remaining chopped parsley and serve with remaining lemon. Enjoy!